What does an electric current bolt of 20,000 amps hitting a jetliner look like? 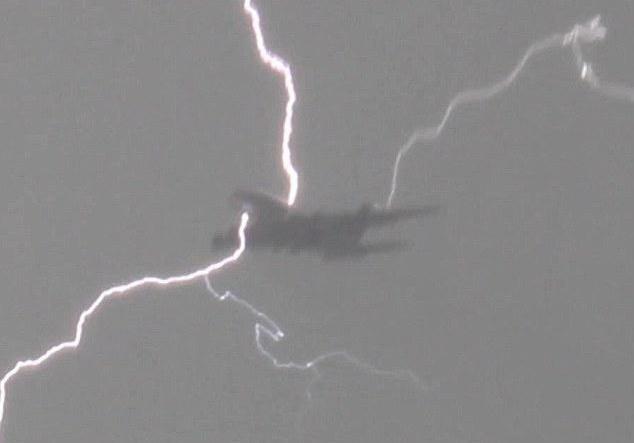 A photograph of a lighting strike on an Emirates A380 illustrates the dramatic appearance. A video taken by Chris Dawson near London’s Heathrow Airport shows lightning striking the giant, double-deck plane, wrapping around it and continuing through the air to the ground. “I saw a storm coming and I thought there could be lightning,” said Dawson of the 23 April event. “I wasn’t expecting it to hit the plane but I just got lucky.” He lives directly below a flight path to Heathrow. An airplane’s metal hull forms a Faraday cage that protects it from lightning, carrying the lightning’s electric charge through the surface of the hull and expelling it at an output point without harming the aircraft, its electronics, or the occupants inside. 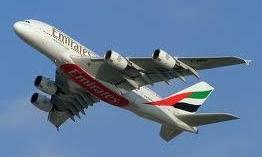 The Emirates A380 landed without incident. Boeing’s new B787 is built primarily of composites, which can be penetrated by lightning and cause damage to systems and persons inside. To replicate the Faraday cage benefit of the more traditional aluminum structure, the B787 will feature small metal pieces embedded in the composite material to carry away the electrical charge. In addition, the B787’s fuel tanks will be filled with an inert gas, displacing any oxygen in the tanks’ void spaces. If lightning penetrates the fuel tanks, it is hoped that it will not trigger a fuel vapor explosion because of the presence of nitrogen-enriched air in the tank. This nitrogen-enriched air in the tanks will lower the percent of oxygen to the point where it is not sufficient to sustain an explosion in the event of lightning penetration. In 1996, TWA Flight 800 blew up from an electrical spark inside its center wing tank. The equivalent – albeit at considerably less power – of a lightning strike. The momentary spark in the dark confines of the TWA’s B747-100 center fuel tank ignited flammable vapors inside and destroyed the airplane. The U.S. National Transportation Safety Board (NTSB), which investigated the TWA 800 tragedy, urged the Federal Aviation Administration (FAA) to require fuel tank inerting on all existing and new transport-category aircraft. Inerting entails filling the void space in the fuel tank with a non-explosive gas, such as nitrogen, to suppress any tendency of fuel-air vapors to explode. The rule affects airplanes with heated center wing tanks only. By this is meant fuel tanks with heat sources such as air conditioning packs adjacent to the tank. The new A380 does not feature a “heated” center wing tank and is therefore exempt from the rule. The NTSB urged that all fuel tanks (wing, body, empennage, auxiliary) be inerted, irrespective of whether they are heated or not. It should be pointed out that 8 of 17 fuel tank explosions in the jet age have involved unheated wing tanks. The A380 exemption from the inerting requirement ignores this deadly history. Passenger jets built prior to 1972 are excused from the new requirement on the grounds that they do not have significant remaining useful life in passenger service. If some of these aircraft are converted to all-cargo use, they do not require retrofit of an inerting system. So much for the FAA’s “one level of safety” theology; cargo pilots will be operating the same aircraft as their passenger-carrying brethren without the same safety system. The FAA’s inerting mandate does not feature any quality control requirements for the tank heating and cooling calculation, although they are obviously of crucial importance.